Anne Jones, MBE founded two pre-school groups in Haywards Heath, and founded Mother and Toddler groups which went all over the UK. She founded a Credit Union, community transport and neighbourly care schemes. She founded Hove Amenity Society. Anne studied at Chichester College and the University of Sussex. Anne is married with four children and has been a carer for 25 years. 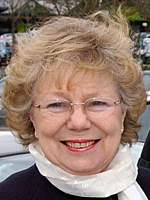 Anne has served as a Mid Sussex District Councillor since 1983 and is also a Burgess Hill Town Councillor. She is a lifelong Christian attending Kings Church Burgess Hill. In her spare time she is an Honorary Rotarian and enjoys reading, music and her family.